CAD-a-Blog: What’s new in AutoCAD 2014? Autodesk recently adopted a new logo and branding, well here is the new Application Menu Icon for AutoCAD 2014 along with the new file Tabs. Figure 1: The Application Menu is updated to reflect Autodesk's new branding. File Tabs can assist in file navigation and creation. The File Tabs are a carryover from a third party add-on. They are now part of AutoCAD. Click on a tab to access that file, right-click on a tab to open, save, or close a file or files. The Plus Sign on the right will start a new file or open one. Clicking on a tab while it is active will give you a preview of the files model and paper space tabs providing quick access. Click the File tabs button in the Ribbon on the View Panel to toggle these tabs on or off. The Command has been enhanced with several autocomplete like features. There is a new Autocorrect that will help you spell your commands properly; Autocomplete will provide a list of commands with your typed text no matter where that text is in the word. It used to only display commands that started with your typed text. Typing SETTING will display many more commands that it used to in previous versions. The command line now has Adaptive Suggestions. 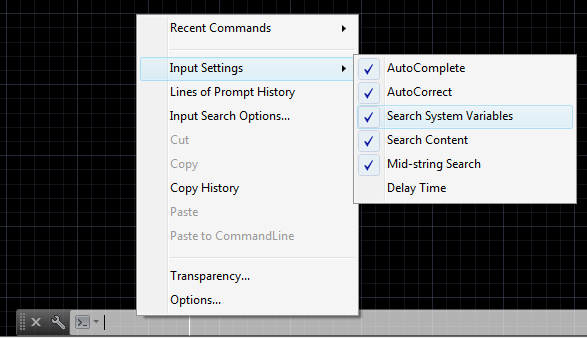 AutoCAD will learn which commands you use most often and display them first in the autocomplete feature. You can also take advantage of Synonym Suggestions. These are alternate strings of text that can be typed in place of the command. Type ROUND to start the fillet command. This list can me edited using the Edit Aliases tool in the Manage Tab in the Ribbon. When AutoCAD provides you a suggestion for a command you are typing there will be an icon that you can click to open either Help or to perform an Internet Search for the command. The Command Line also has access to layers, blocks, hatch patterns, text styles, dimension styles, and visual styles. If you type BOLT and there is a block in the file named BOLT the insert command will start with the BOLT block ready to go. Figure 2: The Command Line has many new autocomplete options available. Xref linetypyes are no longer displayed in the linetype list or in the Properties palette. Before they were displayed in these lists but you could not assign them to the object. They just got in the way. Xref attachment type is easily toggled between Attach and Overlay by double clicking the type in the xref manager and selecting the style you want to use even once it has been set. You can also switch between Absolute and Relative path. You can also remove the path completely and the –XREF command has a new PATHWAY option available in order to facilitate these changes easily through scripting. Several new features in AutoCAD 2014 get their power from the cloud. To use many of these new features you will have to be logged into your Autodesk 360 account. You don’t have to of course but you won’t have access to these new tools. One feature is to sync your settings. Save your settings to your account and download them to any machine where you are logged in to your account. This also enables command line internet search, Autodesk Live Maps (we will look at those later), Design Feed (this is the best feature in this update) and exchange apps. The Online Ribbon Tab has been renamed to Autodesk 360 to better match the branding of Autodesk’s cloud features. This ribbon tab includes the new Open Folder tool that allows easy access to your Autodesk 360 folder on your workstation. It also provides easy access to the new Design Feed tool. 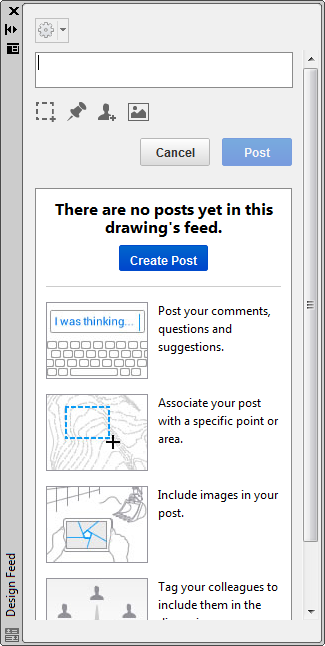 The Autodesk 360 Ribbon tab also includes tools uploading images for a drawing that you can share online through Design Feed. Figure 3: Design Feed provides a means for communicating with others about a specific file. 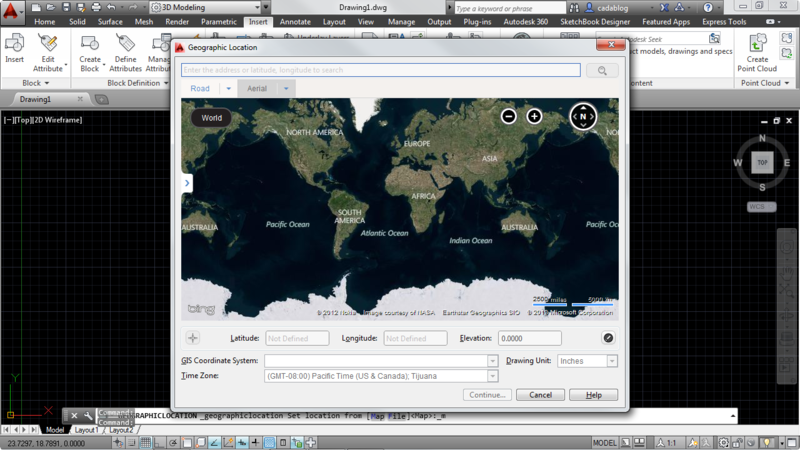 Figure 4: Geographic Location uses Autodesk Maps Service with maps provided by Microsoft Maps. When a map is displayed in your file it will always be set below your drawing geometry. You won’t have to keep messing with draw order to keep it underneath anything. 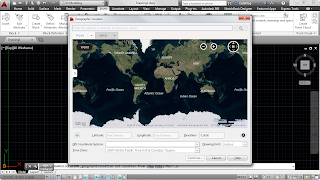 If you are working on a GPS enabled workstation or laptop, use the Locate Me tool to determine your current location. This is a great feature when working on the job site. AutoCAD 2014 has direct access to Autodesk Exchange Apps. Get there by going to the Featured Apps Ribbon. This ribbon tab will also a selection of featured apps that are available for you to download. The Plug-Ins Ribbon tab will give access to the Exchange App Manager and the Import SKP file tools. The Exchange App Manager makes it easy to view and update installed apps. Double-click on an app to choose the Help option from a right-click menu to learn more about it. You can also uninstall or rate the app here as well. Keep in mind that any apps you purchase are associated to your Autodesk Exchange account. AutoCAD 2014 comes with a new tool, Reality Capture. 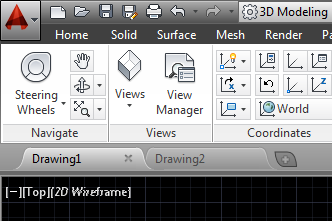 It is a tool that runs outside of AutoCAD similar to reference Manager. This tool takes raw 3D laser scan data of any object or project and processes it into point-cloud data that is more easily read by AutoCAD. This enables users to take large amounts of point cloud data and put it in a more manageable format. Autodesk ReCap will convert the data into RCP files that reference RCS files. ReCap supports many popular formats including Faro, Leica, and Lidar. AutoCAD can now support RCP, RCS file sin addition to the previously supported PCG and ISD formats. Once a point cloud is attached, the contextual tab displayed has more features than previously were available. Stylization controls (clors) are now available making the displayed data match the scanned colors of the actual object. This will assist in visualizing the scanned object. There are also settings for displaying the colors of the objects to a Normal setting (colors based on the normal direction of point) and a setting for Intensity (sets the reflectivity value of points). If normal or intensity data was not captured then these options will be grayed out an unavailable. There are also more clipping tools in the ribbon similar to the clipping tools of an Xref drawing. This reduces strain on the computer systems in that it will have less data to have to deal with. AutoUpdate is turned OFF by default making panning and rotating of the views more smooth in that the computer will not try to render the screen every time the view changes. AutoCAD 2014 does have windows 8 touch screen support. If you are using a Windows 8 touchscreen device you can benefit from smoother zoom and pan performance. There is a new control feature on the System Tab of the Options dialog box that displays a touch ribbon panel when a touch screen device is detected. This Ribbon Panel lets users cancel the current command and returns them to the Select/Command prompt. I tried this out on my Touch Screen running Windows 8 and I rarely needed it as the transition between panning and selecting was rather intuitive and smooth. But from time to time it was needed and it was very useful. AutoCAD 2014 provides a new system meant to help keep you and your users more secure. It is called Secure load. It is meant to help prevent the loading and running of unauthorized or malicious AutoLISP and VBA applications. Go to the Files tab on the Options dialog box and find the Trusted File Search Path. You can also access these controls by using the TRUSTEDPATHS and TRUSTEDDOMAINS system variables. A Security control area of the System Tab in the Options dialog box provides access to the new Executable File Settings. Here you can allow executable file to be loaded from all search paths or only from locations specified by the Files Tab. You can also choose to display warnings before loading executable files outside the trusted locations. These options are applied to the new SECURELOAD system variable. When creating a network deployment these options can be set ahead of time in your deployment. Figure 5: Secure Load can prompt users when executable files are being loaded. A new AutoCAD means that there are several “little” enhancements that have taken place. These are small changes to make existing tools better. You can now draw arcs in either direction by pressing the CTRL key to switch directions. The AUGI Wishlist request to able to fillet a polyline on itself has been granted. Why wasn’t this in there to begin with? When you create a new sheet using the sheet set manager the CreateDate field stored in the associated template file (.DWT) displays the creation date of the new sheet now instead of the creation date of the .DWT file. The CONVERTPSTLYES command lets users convert the current drawing to either a named or color dependent plot styles. It now supports spaces in style names. This is a very small thing but one that might help when naming styles. The default behavior for inserting blocks with attributes displays the dialog box. ATTDIA is set to 1. Single line text is changed to maintain the last justification setting until it is changed. The new DIMCONTINUEMODE system variable gives you more control when making continued and baseline dimensions. When DIMCONTINUE is set to 0, the DOMCONTINUE and DIMBASELINE commands make dimensions based on the current dimension style. When set to 1, they apply the style used in the selected dimension being continued. The Ribbon Hatch tool will maintain the previously used method of selecting a hatch, either Pick Internal Point or Select Objects. The undo option has been added to the command line. In this article we were able to take a closer look at the new features than we normally do because this release had a shorter list than in past updates. What do you think of this releases features? Was it enough? Should more have been added? It was nice to see AUGI Wish-list items marked off. Is this release worth an update? Should you wait for the “bugs” to be fixed? I’m excited to start using the Design Feed tool and I can’t wait to see how others use it. I’m worried the Secure Load features will get in the way (I also predict many rants on the Internet about it). Regardless you will always be able to come to the AUGI Forums for help and for discussion on these new features and tools that Autodesk has given us.